About to find myself visiting Vietnam for the second time, I wanted to make certain I did it right—on motorcycle. I was to be traveling with my girlfriend’s family, and because her Uncle Tom rides, we wanted to set up a little excursion away from the ladies. A friend who had spent some time in Asia had told me about Explore Indochina and explained how that should get me going in the right direction. And it did. If you have found yourself at this site it is most likely not by mistake, so let's get on with it. The cycles we chose were the Russian made 650 Urals, a stoic machine that was filled with as much history, conflict, struggle, resistance, and victory as Vietnam itself. It was a great choice. The Urals ate up the majestic countryside in and around the Sapa area, as we rolled through beautiful hills and valleys lush with vegetation. Twisty roads gave way to the tiered rice paddies that the area is famous for. As timing would have it, our trip coincided with the fall harvest and patches of yellow blanketed either side of the road that stretched out and up for as far as the eye could see. Large mud covered water buffalo stood as silent observers as the banter of our engines sent a drift of piglets scattering—perhaps to their mother’s dismay. The sounds, smells and dust-covered visions still linger in my memory. Explore Indochina runs quite the operation. We were in good hands. The food was as good as the company we kept, with an array of delicious dishes from that area, as well as a few comforting surprises, our stomachs were very happy. The end of the days brought cool beverages and nice conversation to wind things down. 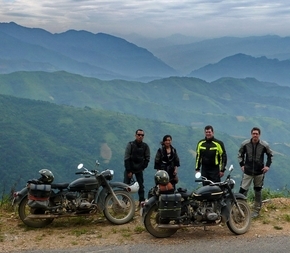 All in all, Explore Indochina was able to take our limited schedule and fill it with as much riding and enjoyment as possible. My hats (helmets) off to you guys, it was a great trip! Looking forward to the next one.